Publishers to Become Ecommerce Merchants? Trends in online commerce, content marketing, and advertising sales may have set the ecommerce and publishing industries on a collision course as both strive for trust, relevance, and profits. 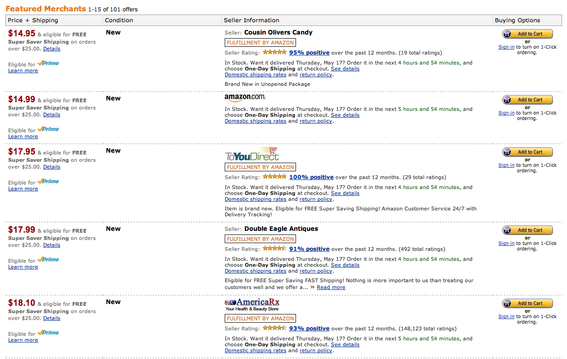 U.S. online sales in just the first three months of 2012 were more than double American newspaper ad revenues for all of 2011. As publishers seek new revenue sources, magazine and newspapers might turn to ecommerce. Online retailing is booming, with trend-tracking firm comScore reporting that U.S. retail ecommerce spending reached $44.3 billion in the first quarter, up some 17 percent from the same three-month period in 2011. “The first quarter of this year was especially strong for retail ecommerce as we returned to year-over-year growth rates in the high teens, numbers we haven’t seen since 2007,” said comScore chairman Gian Fulgoni. All told, U.S. ecommerce has grown from about $27.9 billion to its current $44.3 billion in just five years. The industry’s superb growth rate has attracted a number of new businesses, some relatively large and others founded in garages. With more competition, marketing and presentation has become increasingly important. Matter-of-fact product descriptions and ho-hum product photography will not set an online seller apart in an Internet marketplace where retailers can become indistinguishable purveyors of products, whose only competitive advantage is a lower price. For an example, search for just about anything on Amazon. 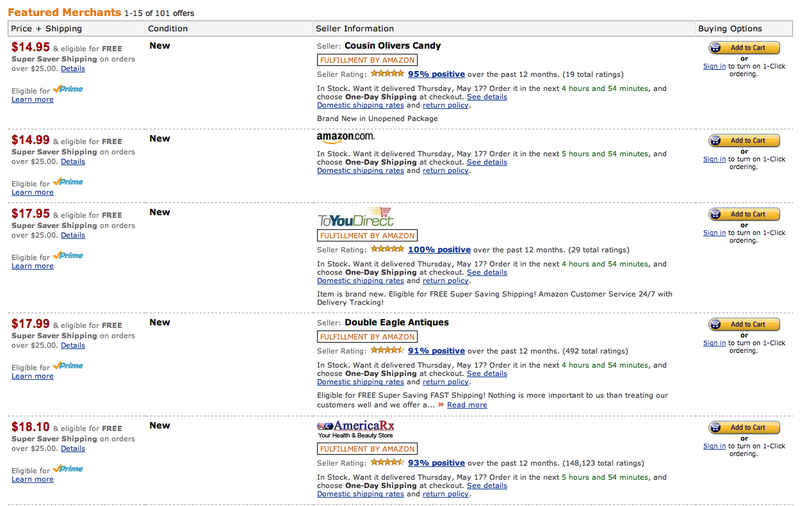 A search for the Monopoly board game on Amazon reveals 101 merchants selling the identical product. Selling on the Amazon Marketplace can certainly be profitable. Nonetheless, many online merchants want to build lasting relationships with customers so that those shoppers remain engaged and make subsequent purchases. One possible route to long lasting, brand-and-customer relationships is content marketing. Content marketing, in the context of online retailing, relies on high-quality content like articles, images, and videos to engage prospects, earn business, and create repeat customers. Several well-known and emerging retailers use this strategy, with examples being companies like REI, One Kings Lane, Maker Shed, Mr. Porter, Radio Shack, Park & Bond, Element 14, and Gilt Taste to name a few. The basic concept is that shoppers will be more willing to make repeat purchases from a retailer if that retailer is also providing information and entertainment. 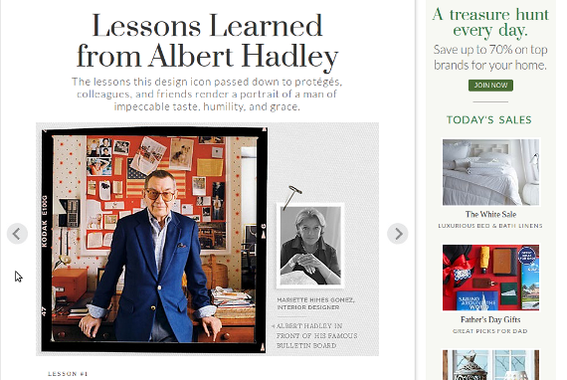 Consider a recent article on One Kings Lane, titled, “Lessons Learned from Albert Hadley” that reads more like something from a fashion magazine than an online retail site. “The lessons this design icon passed down to protégées, colleagues, and friends render a portrait of a man of impeccable taste, humility, and grace,” wrote Mariette Himes Gomez, the post’s author. The One Kings Lane post also features fashion-magazine like images. Similarly, a brief post on Post & Brand features a photo shoot with Brazilian actor, Rodrigo Santoro, that might have come directly from a top men’s publication. Well beyond simple product photos, the Santoro article is akin to an online magazine article. For a more technical example, there is Radio Shack’s “The Great Create” site that features do-it-yourself electronic projects like building simple walking robots and hacking old landline phones. 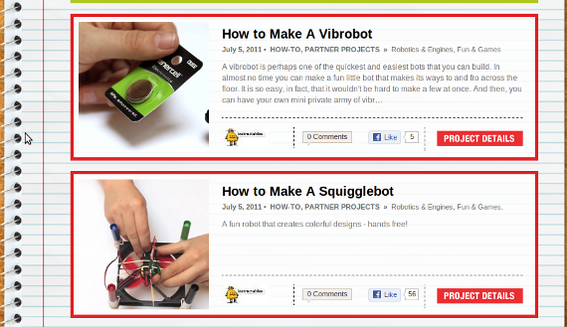 Radio Shack markets with how-to articles. In some sense, content marketing is encroaching on the publishing industry. In times past, newspapers and magazines were the creators and distributors of content. In the Internet era, however, just about anyone can be a publisher, and this is having an effect. Dr. Mark J. Perry, a professor of economics and finance at the University of Michigan’s Flint campus, charted advertising revenue for American newspapers from 1950 to 2011. The chart relied on data from the Newspaper Association of American adjusted for inflation, and stated results in 2011 dollars. 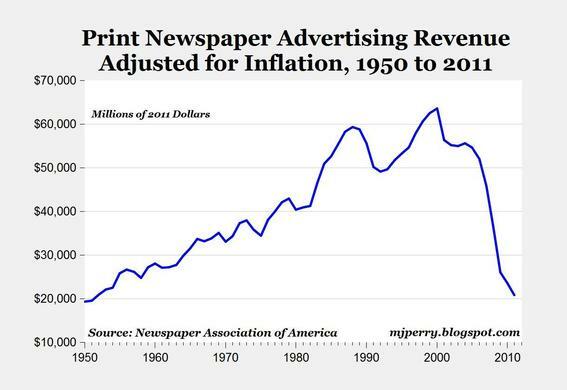 American newspaper advertising revenue has plummeted. “It took 50 years to go from about $20 billion in annual newspaper ad revenue in 1950 (adjusted for inflation) to $63.5 billion in 2000, and then only 11 years to go from $63.5 billion back to about $20 billion in 2011,” wrote Perry in the accompanying blog post. Even online advertising sales have been affected. Perhaps to compensate for both the content marketing encroachment and shriveling ad revenue, some publishers have begun to enter the booming ecommerce market. In November, as an example, J.C. Penney and Heart’s Esquire magazine launched a short-lived ecommerce venture called Clad. 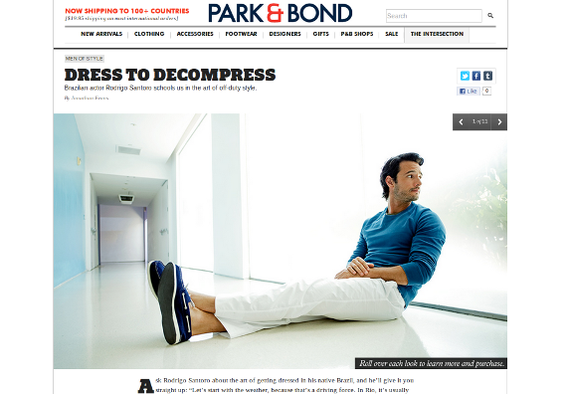 The site, which was shuttered on April 27, 2012, paired Esquire recommendations with men’s fashion clothing. Although, this particular venture failed, it may be indicative of the trend. More recently, Time Out New York, a self-described “obsessive guide to impulsive entertainment,” began selling event tickets on its site. Other publications — like women’s magazine Elle — have begun to make online editorial shopable. Ecommerce sales growth may be causing an increase in ecommerce competition. Increased competition has given rise, in part, to content marketing, wherein some online retailers are becoming content creators. Publishers, already feeling downward pressure on ad revenues, recognize that content can help sell products and may be looking for partners for ecommerce ventures.